The temps have dropped and without fail, I cannot leave my house without seeing the BIGGEST MISTAKE new parents can make with their baby in the winter time: FLUFF AND OTHER STUFF IN THE CAR SEAT. Whether it’s an infant car seat with a JJ Cole Bundleme under the baby, or a baby in their huge, giant puffy snowsuit, strapped in to their car seat, I feel like shouting from the rooftops (and often feel I do!) that this is WRONG AND UNSAFE! NEW PARENTS AND OLD, THIS ADVICE IS FOR YOU! I know it seems crazy because it’s freezing cold outside (-2F in Chicago and even colder in Minneapolis today), but please do not put your baby in their infant car seat in a puffy jacket or snowsuit. I also know it seems like you should use the JJ Cole Bundleme on the infant car seat, but actually, you shouldn’t. 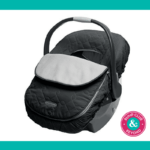 JJ Cole makes a GREAT product for you to use instead that is meant for car seat usage: The Car Seat Cover. Save the Bundleme for it’s intended use: your stroller. 7am Enfant Blanket 212 Evolution, $189: If there is ONE product that you need for your stroller in a cold climate it’s this. It grows with your child from infancy to preschool keeping them warm and dry from top to bottom. Depending on your stroller, many brands make their own foot muffs. Some of our favorites are the Orbit Baby Foot Muff (it’s organic, $140), Bugaboo Footmuff ($129.95) and the UPPAbaby CozyGanoosh ($129.99). Check your stroller brand’s website for more details. One of our favorite experts, The Car Seat Lady, shares the Dangers of Fluff here. Take a minute to read this. It’s important. While this post only addresses infant car seat usage, the FLUFF rule applies for convertible car seats too. To my own mother’s dismay (because they might catch a cold! ), my kids take their puffy coats off and put them on over themselves every single time we get in the car. I am not a Car Passenger Safety Tech. But I have been around MANY of them throughout the six years Bump Club and Beyond has existed, and ALL of them share this information in their seminars and on their blogs. Car seat misuse is at an all-time high. Please take a minute to consider these safety tips and read your car seat manual to make sure you are using it properly. Doing so could protect your baby in the event of a car accident. EDITOR’S NOTE ON PICTURE ABOVE: This picture was used because our stock photography provider ONLY had pictures of infants shown in their car seats wearing fluff, with their straps loose and in every other wrong position possible. We have since sent a note to them.